This is one of most frequent SCAMS sent to the general public. It looks like a renewal notice for your domain name(s) but in fact is a company that has found your information on the Internet. 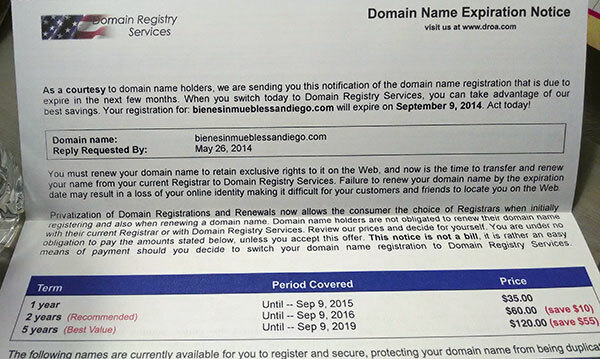 Do not renew your domain names through a company that is not your registrar! Renewal notices should be sent to your email. And, like other secure sites, you have to log in to your account using your account password to proceed to your renewal. Renewing should not cost double of what you paid. Suspicious: If you get something suspicious in the mail call US, or your customer support number.